Andriy Khomyn RDT, DD provides the fastest, most dependable denture repair service in Oakville and Mississauga. Our denture clinic has a complete on-site denture lab to make any denture repair you need while you wait. We are here for all your emergency denture repair needs in Oakville, Mississauga, Brampton, and Etobicoke. Our experienced Denturist will offer custom repair solutions for every type of denture. There is no reason you have to go without dentures for multiple days. Fortunately, with our emergency denture repair service, you won’t have to. We can fix your dentures in under an hour while you sit and relax in our cozy private waiting room. Your denture will be repaired on-site by our expert technicians while you wait in our comfortable waiting room. All denture repairs are made using the highest quality materials to ensure they will serve you many more years. All on-site denture repairs are executed by highly trained technicians in our state of the art laboratory. These dentures restore all the missing teeth in the arch so that your appearance can return to normal. Without your denture, your facial structure will not get the support it needs and will make you look older. Regular dentures may be comfortable and allow you to chew properly, but they are not custom-made. They are only designed with the basic tooth color and mold for the average patient. Every denture patient may need a uniquely-constructed denture. This is especially the case for those with shrunken oral tissues or unusual jaw relationships (bites). 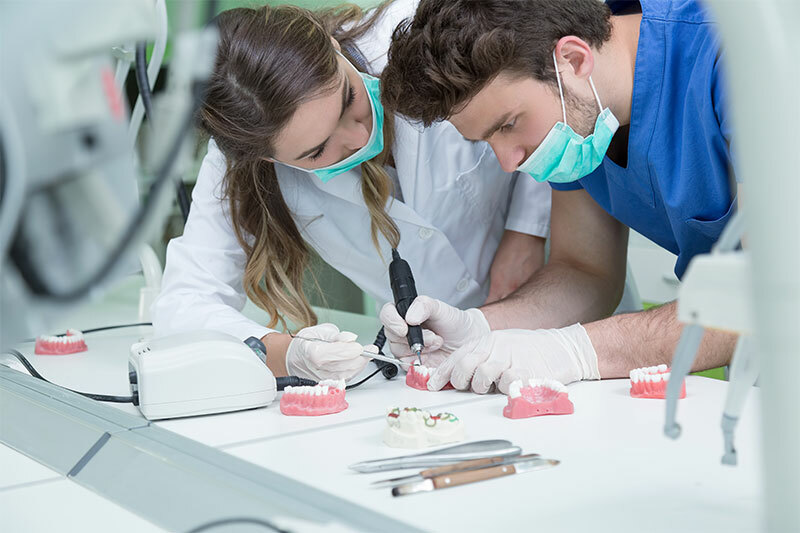 Our denturist, Andriy Khomyn, offers custom designed precision dentures using the best materials and techniques available. Denture implants have been proven to be the most cost effective reliable solution for patients like you. Most patients who choose this treatment option feel happy and confident for the first time since the loss of their natural teeth. Our Denture laboratory is equipped with the latest precision denture technology available in on the market. Complete customization of your dentures is ensured by choosing the right shape and color of the teeth that perfectly matches your smile.